I’ve been taking archery classes for about four months now. It looked like fun and I wanted to try it. Also, I plan to write a main character who uses a bow for survival, so I wanted to have first-hand experience. If that sounds like an excuse well… Okay it is an excuse. I found out that it not only looks like fun, it is fun! But now whenever I see characters on TV and in films with a bow, I notice the inaccuracies. Partly because I want to make sure my writing is as realistic as possible. First of all, a real archer would never hold the bow when she draws, aims and releases the arrow. When you see that archer in a film drawing the bowstring and gripping the bow with their bow hand? There is no way that is real. After safety, this was the first lesson. Gripping the bow with your bow hand when you shoot throws off your aim in an unpredictable way. So a real archer wears a finger sling – a loop of cord that goes around the bow and is attached to the thumb and a finger of the bow hand so the bow does not fall to the ground after he releases the arrow. Another thing I notice on TV and film is the fictional archer’s anchor. When the archer draws the bowstring, are all three fingers under the nock, with hand resting (anchored) against his cheek? Is the nock between the first and second fingers with the hand under the jaw? Is the palm turned inward or outward? I have tried all of these techniques in class. In the current modern sport, which one depends on the type of bow, usual range, individual preference, and probably lots of other things I haven’t learned yet. In the fantasy or historic setting of a story, the anchor method would be a significant identifier of where (region or culture) the archer was from. For accuracy, the important thing is consistency and releasing the bowstring without conscious movement – your fingers simply relax. All movement in the bow arm when the arrow is released comes from tension in the back muscles that are working to draw the bowstring. I’ve learned that you never (intentionally) “dry fire” a bow. That’s what it’s called when you draw the bowstring without an arrow nocked, and release. The energy that would otherwise go into the arrow and send it flying feeds back into the bow instead – it can break the bow. One way that could happen accidentally is if the arrow’s nock breaks. So a good archer always takes care of her arrows and inspects them regularly. Another thing I will be taking into consideration when I write an archer is that shooting arrows is very tiring. A long bow (the most likely version in a low-tech setting) requires a great deal of strength just to draw. A composite Recurve bow (like the one Katniss uses in The Hunger Games film) is not as difficult to draw (it’s the type I usually use in class), but still wears you out. A compound bow is more high-tech (that would be my choice for a steam-punk setting) and makes it possible to “hold” the bow in the drawn position without much effort. 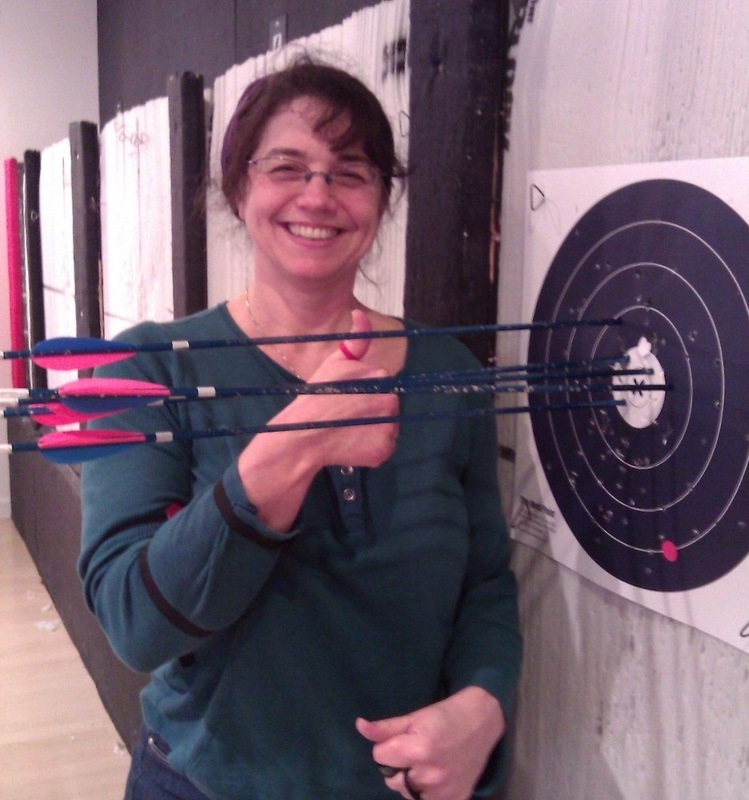 The character I write who is relying on her bow skills to survive will also need to practice every day. Luckily she won’t mind. Because shooting a bow is fun. This entry was posted in Writing Path and tagged archery, arrow, bow, distraction, fictional archer, heroic fiction, rpg, writing. Bookmark the permalink. This was absolutely fascinating! I hope you’ll add more info. And I can’t wait to hear about your archer story. Thank you! I wish I had your skill with humor. Your blog is one of the funniest I’ve run across. Very cool! I have a long-bow a customer of our bookshop made for me. I need to get out with it more often. Adam – awesome that you have a long-bow. One of the problems with practicing around here is finding an archery range. My class is in Montlake Terrace, about a 45 minute drive (with a really nice indoor range). A question-did they use finger slings back in the day? (re: historical settings.) and do you know what they were made of? Yes! I have seen this video, and it is awesome. Lars Anderson is an extremely accomplished archer, and has trained for years to perfect this technique. And, obviously he IS gripping the bow! So what I’m saying may not apply to historic archery. Although I still think that for the average archer to achieve any accuracy at long range, a finger sling would be needed.